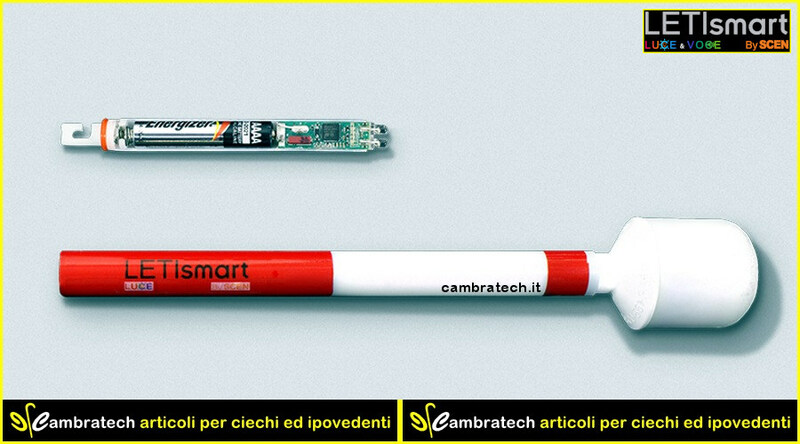 LETIsmart LUCE. The best way to show us! 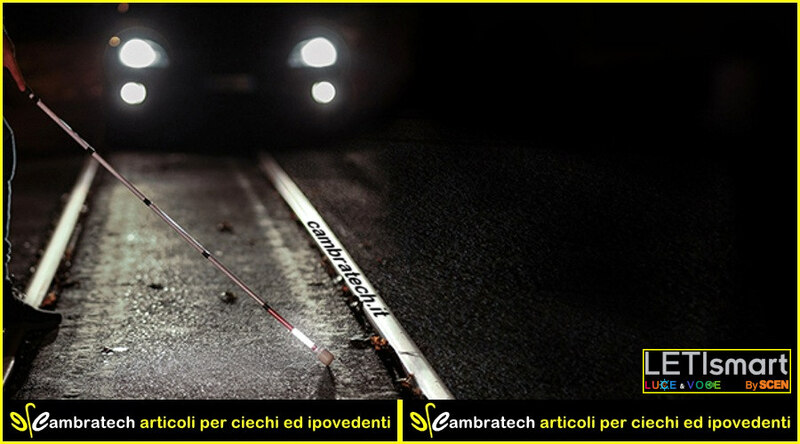 LETIsmart LUCE is the innovative kit that illuminates the last segment of your white cane. Walking in the evening or in low light will become safer. In practice LETIsmart is a wand with light that replaces the last section of your folding cane. LETIsmart LUCE illuminates the last segment of your cane with a cold, pulsing light that can be recognized from a great distance. The light beam is directed towards the ground, evenly, around the cane. The light is designed not to disturb the user, so it is also suitable for those who are visually impaired. When it is dark or the environment is poorly lit, with LETIsmart LUCE you can cross the road with the security of being seen by cars. You will know that the driver will stop at the bus stop. You will help other people to understand if you are in trouble. 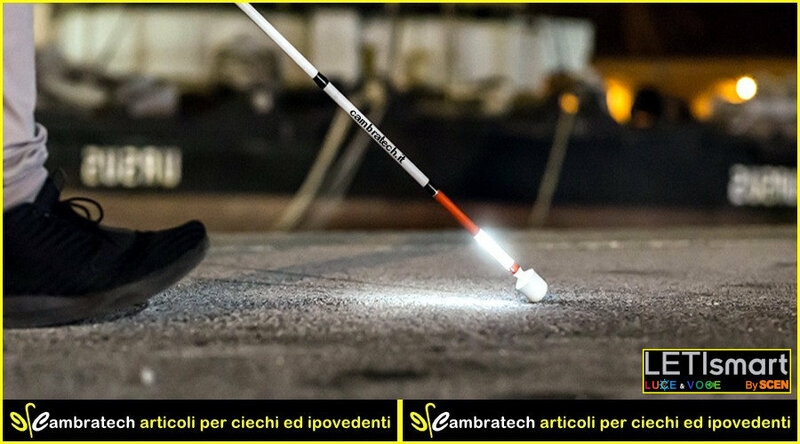 Made with the most innovative microelectronics technologies, LETIsmart LUCE, as mentioned, is a small and light kit that replaces the last cane near the tip of the cane. LETIsmart LUCE maintains unchanged the technical and usage characteristics you are used to. 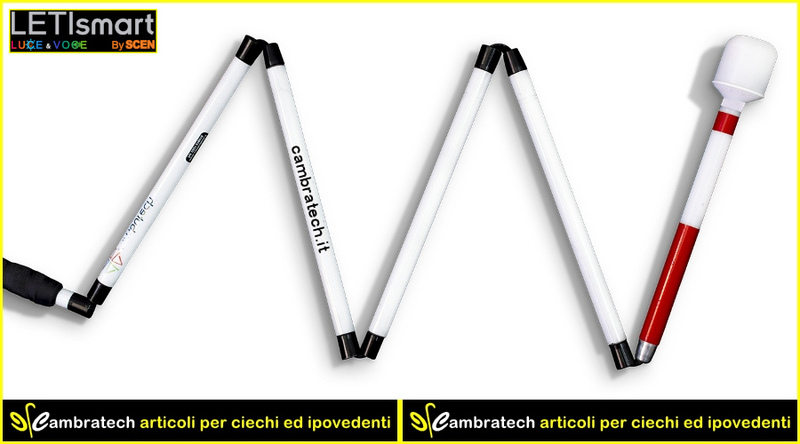 It is compatible with the most common models of white canes and interchangeable tips with screw coupling. The LETIsmart LUCE kit is a tubular that replaces the last segment of your cane. It is built with a particular polymeric material that combines lightness and strength, even in case of impacts and bad weather. Inside there is a microcircuit weighing a few grams. It is able to turn on and off the light automatically reacting to low light conditions. Its special sensors allow the light to stay on even if the cane is hit by the light from car headlights or other temporary light sources. More autonomous with LETIsmart LUCE. Using LETIsmart LUCE is easy. You will know when the kit is on or off thanks to a sequence of beeps, which also informs you about the battery charge status. You will be autonomous in replacing the battery, a standard microstyle that guarantees you more than 30 hours of light signaling. The shutdown is automated: when you fold the cane there will be no need to use buttons, switches or wires. LETIsmart LUCE has been tested and certified by the Italian Union of the Blind and the Visually Impaired, by the IRI.Fo.R (Institute for Research, Training and Rehabilitation in Visual Disability) and by ANIOMAP (National Association of Guidance Guidance for Mobility Guidance) personal autonomy), the most important realities operating in visual disability. LETIsmart LUCE was born from the idea of ​​Marino Attini, president of the Trieste branch of the Italian Blind and Partially sighted and consumer electronics, and SCEN, a leading company in the microelectronics sector. SCEN's great experience in military, medical and aerospace technologies and its important collaborations all over the world attribute unique features to your LETIsmart LUCE cane. The result is a highly technological product, simple and affordable for everyone. How can I have LETIsmart LUCE? - Order a new cane asking to apply LETIsmart LUCE. Which models of canes does LETIsmart LUCE apply to? - Canadian White cane in Graphite, code HG4690. Essential features of the LETIsmart LUCE. - Water resistant, as long as it is not completely immersed. - It has neither wires nor switches and switches off automatically with a magnetic sensor when the cane is folded and placed parallel to the segment that precedes it emitting a sound signal, "beep", closing. - Simple replacement of a common AAAA microstyle battery by the blind or partially sighted user. - Average value of battery life: for example with a use of the cane equal to 6 hours per day of which 1 hour with LETIsmart LUCE on we have a range of 12 days. - Power supply: 1.5 V alkaline microstyle battery, AAAA, included. On request we also sell packs of 2 batteries for € 2.50 VAT 22% included. - LED number and type: 2 OVL-3321 InGan / sapphire. - Luminous intervals: 3 / second. - Light Color: Cold White. - Autonomy (LEDs on): 30 hours. - Autonomy (light analysis): 200 hours. - Autonomy (closed): 1000 hours. - Digital sensor: High ambient light sensitivity. - Bright visibility: 360 degrees. - Tube material: Homopolymer acetal resin. - Tube weight: 15.50 gr. - Weight sled with battery: 10.00 gr. --- 3 beep = battery voltage greater than 1.4 V.
--- 2 beep = battery voltage between 1.3 V and 1.1 V.
--- 1 beep = battery voltage greater than 1.1 V.
For demo video-audio, italian language, click here. PRODUCT CODE: HG4690 + EL15. PRICE: € 135,00 no VAT.